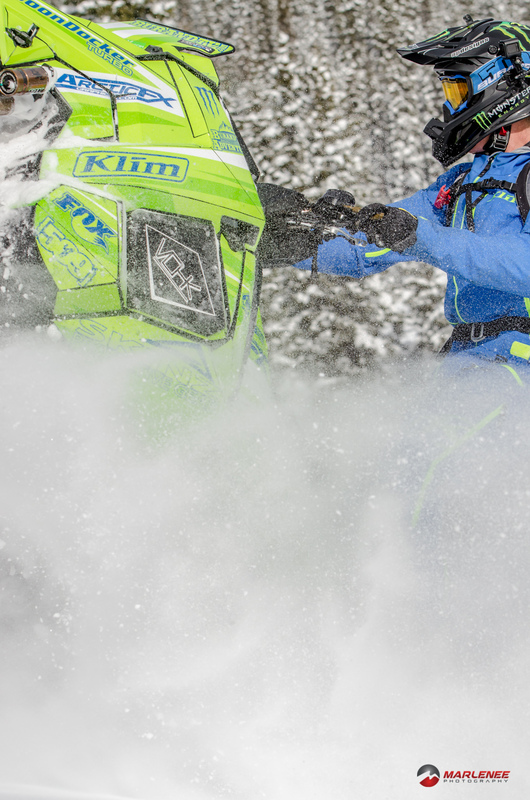 Getting to ride with Chris Burandt is an experience you have to try, even if only once in your life. I can’t explain it, but there’s something uniquely awe-inspiring about it. 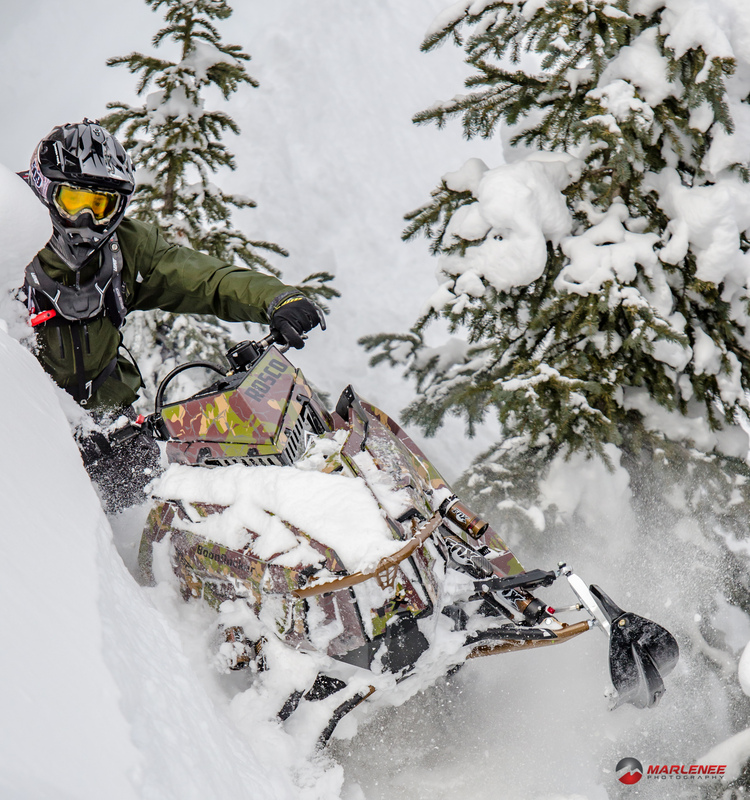 I don’t know if it’s just his calm, but overwhelming presence, his ability to ride, the difficulty of his terrain, or perhaps, just the fact that he has managed to make a living out of snowmobiling, but there is something special about a weekend at Burandt’s Backcountry Adventures. Prior to this season, I’ve had very few opportunities to ride with Burandt. 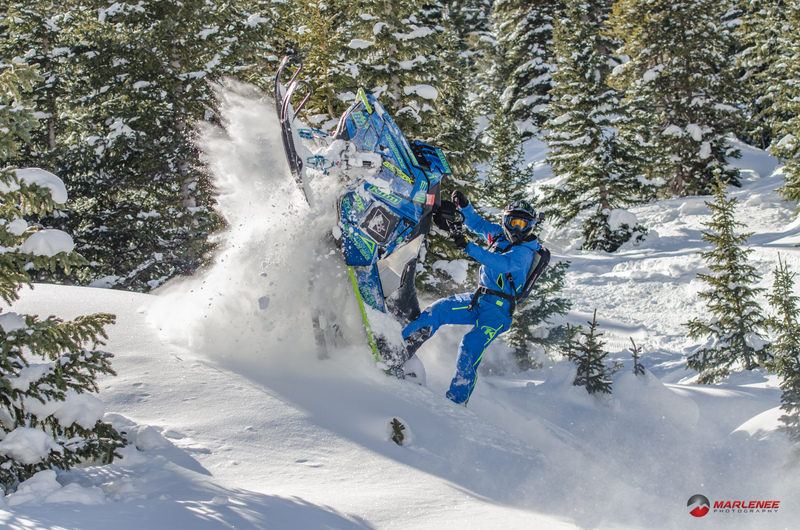 Serving as a member of the Colorado Snowmobile Association, I do get the chance to talk with him from time to time, but usually that is more of me asking him to help out with fundraisers or clinics or maybe to donate some merchandise to raffle, which he always does. My interaction with him has always been professional and he has always been very courteous, but still, he’s a top-level pro in this industry, a fact that can sometimes be daunting to me. I had butterflies in my stomach. I had been tasked, both from Klim and Boondocker Turbos, to get some ‘Burandt’ content. It was mid-way through the season, and I had just returned from Revelstoke, ready to again hit the famous Champagne Powder of Colorado. As picked up my phone and pushed send, my gut wrenched, fearing rejection (without reason). He answered, “Hey, man”. I asked if I could come and get some video and photos. “Sure! Come down Thursday, we are supposed to get a storm”. I agreed, and hung up. Wow, that was easy, I thought. I loaded my stuff up and headed down early Thursday morning. Buena Vista is about three hours from my house, if the roads are clear. Overrun with anxiety, I couldn’t sleep, and was on the road by 3:00 AM. While the trip through Denver was clear, heading South on US-285 was a nightmare. I was out, before the plows, and the wet heavy snow pushed my pickup across the lanes. Soon, the cooler temperatures prevailed, and the snow became light and fluffy. My pickup was tailed by a half-mile long cloud of snow-dust, glistening in the rising sun. I didn’t meet a car until I arrived in Buena Vista, around 8:00 AM. I needed to be at the BBA (Burandt’s Backcountry Adventures) complex by ten, so I had time to grab some breakfast at the local diner. I sat at the bar and overlooked the line-cook as he prepared hash browns, four square feet at a time. The steam of my coffee simmered out of the cup, like a classic Maxwell House ad. I devoured my breakfast in an attempt to build up my energy. Although my curiosity and excitement had me edgy, I knew it would fade the minute my sled started. As I pulled into the long driveway leading up to BBA, I was filled with pride to see one of my photos from last year adorning the triple-axle gooseneck trailer that Burandt uses as a billboard for his property. I quickly darted into the ditch and snapped a quick Instagram photo. The gravel driveway into BBA is nearly a mile long, and hadn’t been graded in some time, forcing me to an idle speed. I wondered if Burandt did this on purpose to build a dramatic suspense for those coming to ride with him. I was early, but made my way to his shop where I was greeted by Ross Robinson. He helped me haul in some camera gear and I setup in one corner of his office, hoping to document the entire day. 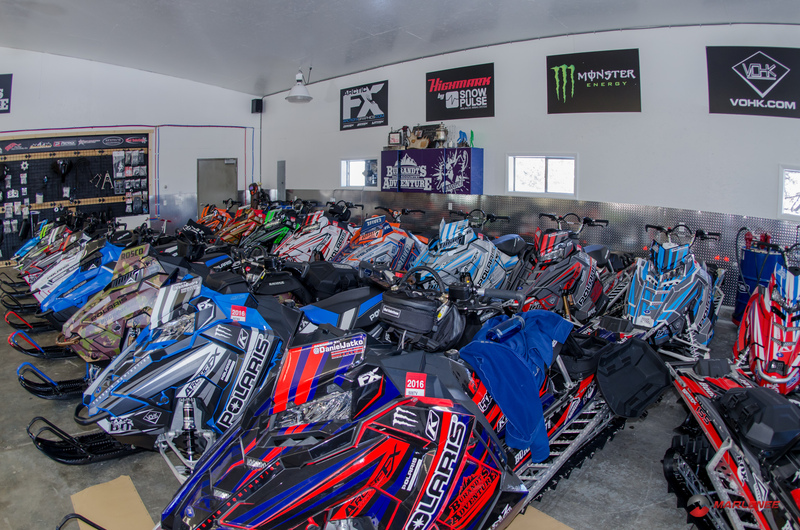 Without much conversation, Ross returned to his autonomous duties of preparing sleds and gear for their clients. I got the impression that he had been working in the shop for several hours. Soon, clients began to wander in. I didn’t know where they were coming from, but one-at-a-time, they appeared through the door. It was obvious that they were as eager to ride with Burandt as I. They marveled over his fleet of Arctic-FX wrapped sleds, each one unique in appearance and name. In Ross’s pocket was a notebook where the name of each sled was written, followed by months of notes for each: spring rates, belts, any maintenance, and all of the tuning information. I hadn’t seen anything like it, except for Erik Woog at VOHK, and was impressed. 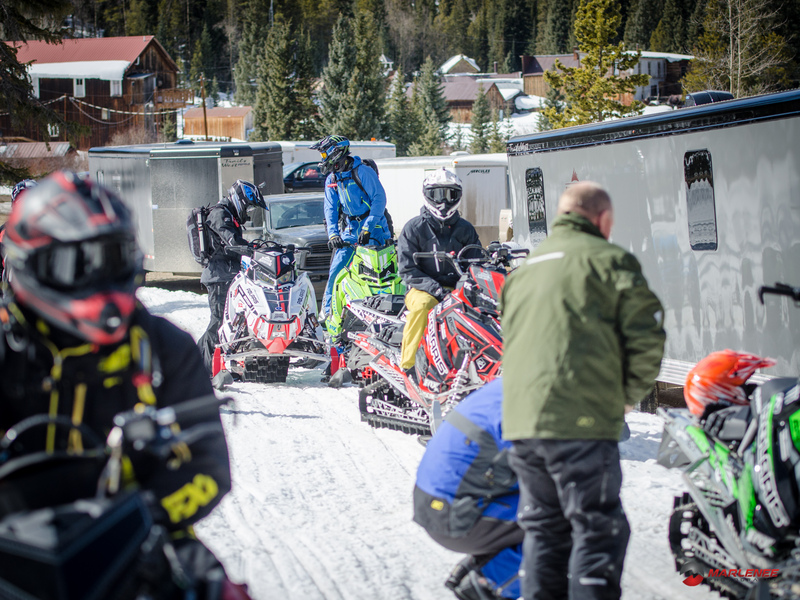 As the viewing session came to a conclusion, Ross, assisted by the more enthusiastic of the clients, loaded the sleds into one of two Signature-series Trails West Trailers. Like school-children, each client wheeled their gear bag to their respective trailer and we headed towards the riding, a 45-minute drive from BBA. Burandt’s fame wore off, for most, during gear-up. Chris kept things really casual, and everyone spoke between each other like friends. Sitting on the rows of benches in Burandt’s trailer, people talked about their families, children, pets, and told stories of other rides. What seemed like an hour passed, and, finally, everyone was ready. 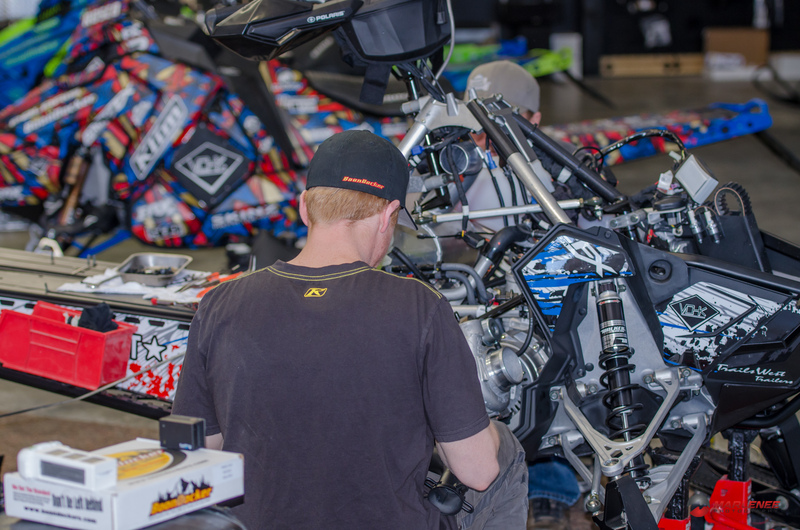 Ross had unloaded all of the sleds and performed his final check. Standing outside, Burandt reviewed the avalanche report, and talked safety, directions, and a little about our ride. He let everyone know who I was, and that I’d be tagging along, snapping some photos and videos, and everyone seemed excited. This day, most of his clients were flat-lander’s. Growing up a flat-lander, I could appreciate them. Most were already short of breath, just leaving the 10,000-foot parking lot. They raced down the trail, two-by-two, rubbing side-panels as they jockeyed for position. Although unspoken, it was a race. I calmly enjoyed watching it from the back of the pack, alongside Ross, as we noted their enthusiasm. I wondered how long it would last at this elevation. The trail was well-maintained, fast, and mostly straight, but was at the bottom of a ravine of two adjoining well-treed mountains. It kept you wondering, hiding the beauty of the terrain. Rounding the last corner, the vista opened up into a giant meadow, surrounded by a ridge-line, forming a giant bowl. More than half of the riders took off across the meadow, each demonstrating their prowess on a sled, showing off, of course. Another hundred yards past that meadow, we were back on the trail, each following Burandt in a single file line. Chris slowed and raised his right hand, signaling a stop. Again, I was at the back of the line, but he shouted for me to come forward, and I did. He pointed out a few lines to me and I readied my gear. Patiently waiting, Chris sat, as I nodded my head, signaling my readiness. Burandt disappeared into a deep drainage and I listened, trying to pinpoint where he’d come back into sight. The shift from anxiety to the confidence of being at work was automatic. 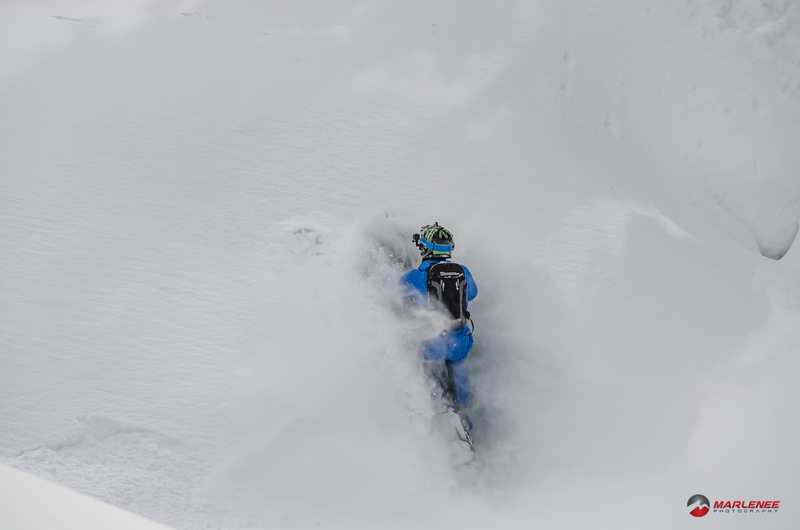 In a cloud of fresh powder, Burandt emerged across the drainage. He hopped over several times, as my shutter clicked in repetition, intermittently blocking my view. He used up most of the snow in this small area and again, disappeared behind the terrain, heading back towards me. I jumped back, startled, as he emerged, riding only on the back six inches of his track, just a few feet away from me, but in perfect control. He softly set the nose of his sled down, and dismounted his sled most casually. I turned around to gauge the audience. Those that weren’t cheering had their iPhones out and were recording, each wanting to take home evidence of the experience. Burandt took a moment to go over technique, and let everyone know that we would be forced with similar challenges, just around the next bend. As I returned to my sled, Ross pointed out the down-hill side of the trail, opposite to where Chris had just ridden. I pulled my camera back out and spent another ten minutes with him, as he danced the sledder’s ballet across the hill-side. We rejoined the group to chaos. The further that Ross and I came around the corner, the more sleds we saw. 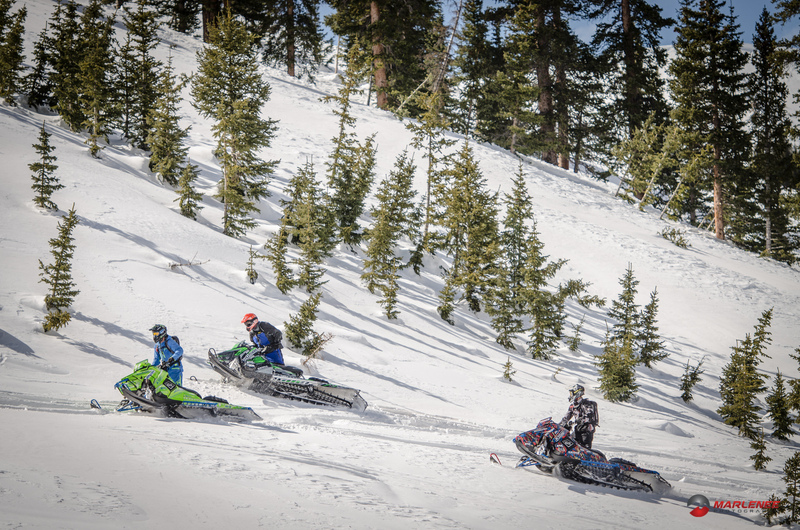 Like tombstones in a graveyard, sleds were stuck, buried by each rider, so deeply that only ski tips and front bumpers could be seen. It was obvious that instead of turning out, each person tried to power out, and failed. And, beside each sled, sat a rider, exhausted, with one hand on the bars, resting. Chris called for everyone’s attention as we reviewed proper technique for getting unstuck. It was a trap that Burandt and Ross were expecting. I laughed, glad to not be stuck, but also happy to see this crew learning the ways of the high-country. I helped a couple of them with a quick ski-tug and we continued up the drainage. The day continued on with the same organization. We would pull into a new area, fresh with snow and ample space to allow everyone to learn how to make decisions. Burandt and Ross would review some techniques, and send people out to practice. They would rotate through each client, working for five to ten minutes, trying to get each person comfortable with various maneuvers. Somewhere around 3:00 PM, Burandt asked everyone how there were doing, on a scale of 1-10. Everyone responded five or higher. I’m sure Burandt snickered to himself, I did. I could visibly tell that everyone was wiped. 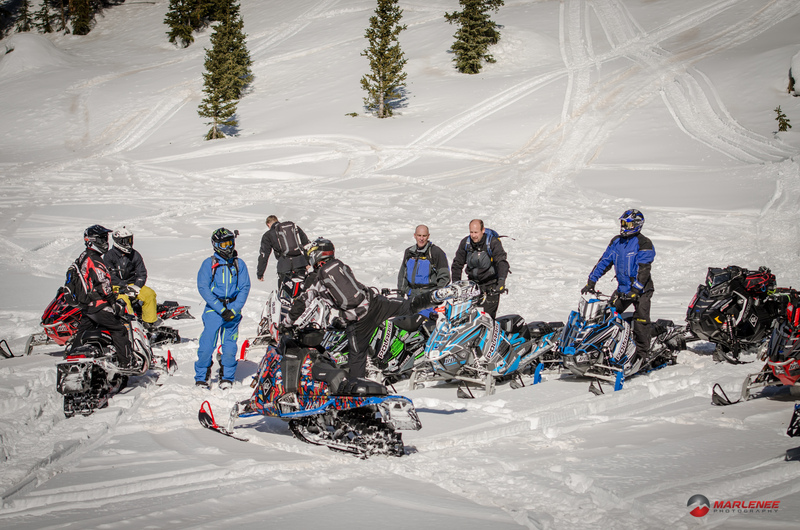 It had been a hard day, with dozens upon dozens of stuck sleds to retrieve throughout the day. We made it another hundred yards, and again, everyone was stuck. At this point, the terrain was easy, and there was no justification for the poor decisions, other than pure exhaustion. One client piped up, “when I said seven, I meant one. I am a one on a scale of one to ten.” I laughed, choking on my altitude cough. Chris came over to me and told me it was time for us to head back. I tried to reason with him that it was sunny and I thought we’d have an excellent golden hour. His response? “No, we have to go, it’s Ghost-Ride-Thirty”. 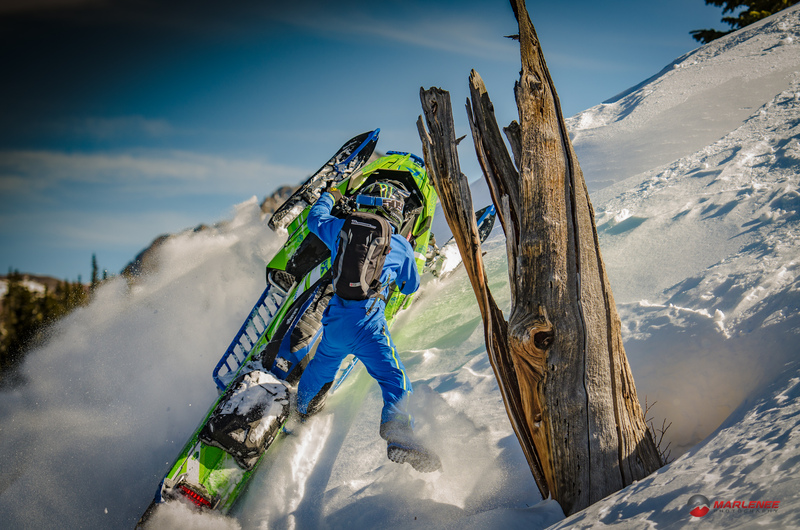 No sooner than he said that, the first person to get unstuck got bucked off their sled, on the smallest of hillsides, and their sled took off like a rocket, down the hill, careening into the trees. “See what I mean”, he uttered with a comedic tone. Again, I laughed. We retrieved his sled and headed to the trailer, everyone relieved to be done for the day and satisfied with their efforts. At the trailer, we took off our gear, and again, like friends, each client took their turn, glorifying his or her best line of the day. And, Chris supported each of their triumphs, endorsing each of them as good backcountry riders, and, some were. For those whose stories resulted from a crash or peculiar stuck, we laughed, and enjoyed thinking about it from their point of view. No one had a bad time, and everyone had a day to remember. The next day was an exact duplicate of the first, except different terrain. And, as I drove home, I couldn’t help but think how much fun I had, even for being at work. For those who want to ride the mountains, the best suggestion I have is to go out with someone like Burandt, Entz, or Adams. Go, and really learn how to ride. Being able to ride makes the mountains SO MUCH MORE FUN. Plus, it’s an experience that you will remember for your entire life.